Society of Medical Doctors (SMD) is a professional body of Malawian Medical Doctors whose fundamental objective is to provide a vehicle through which medical doctors can support the delivery of good quality health to Malawians, especially those in great need. In early March the southern parts of Malawi were affected by massive rains and subsequent flooding. 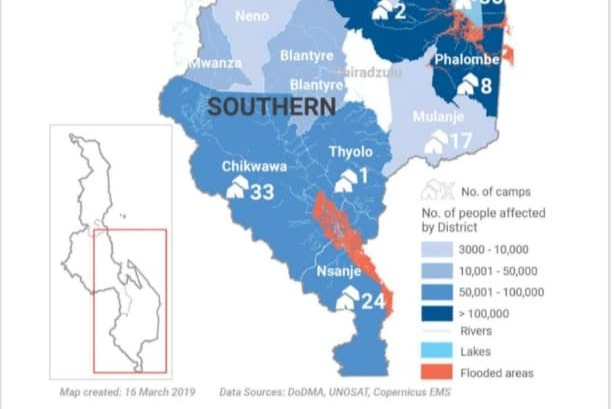 According to the Declaration of National Disaster by Malawi Government, the affected districts include Chikwawa, Nsanje, Balaka, Blantyre, Zomba, Ntcheu, Mwanza, Machinga, Phalombe, Mangochi, Thyolo, Dedza and Neno. Over 840,000 people have been affected with approx 173 camps set up in the various districts. In response to the recent humanitarian disaster and a declaration of emergency by the State President, SMD is deploying mobile clinics and other relief services in the affected areas. Mobile clinics began in 3 of the worst affected districts - Chikwawa, Phalombe & Nsanje the weekend of 29th March. Following this teams will then move to other districts sequentially as well as mantain ongoing presence in the districts already visited. 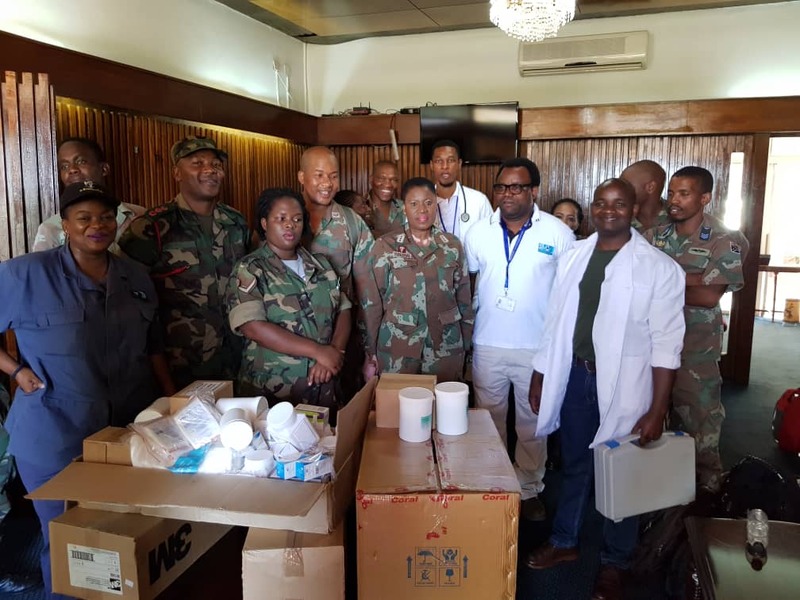 Over 50 Malawian doctors have volunteered to be part of the relief efforts. The doctors will split into teams spanning all the camps. Funds raised will assist in procuring medical supplies and logistics towards the medical camps during this emergency. 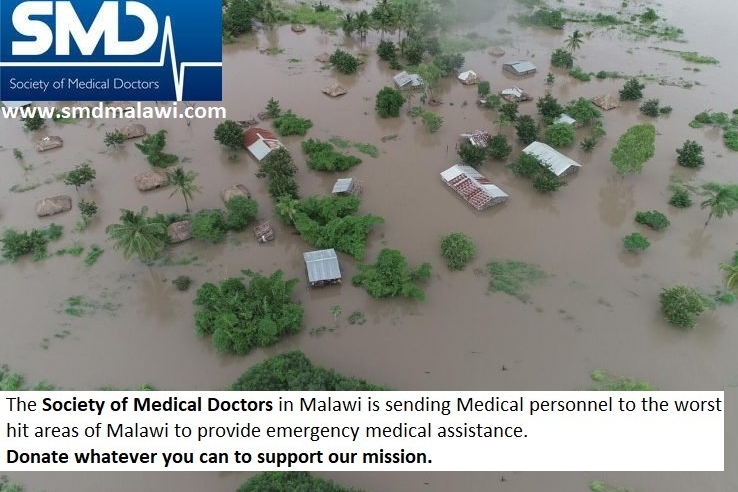 To facilitate transfer of donated funds to Malawi - Dr John Parks a US Family Medicine Physician currently based in Malawi - will be assisting with transfer of funds to SMD account in Malawi via an organisation known as Med Ed Exchange. Our work has been highlighted in today's newspaper. Thank you all for your contributions - we have raised $6,000 of the targeted $10,000 - last weekend our team of 45 dedicated volunteer doctors, students and nurses went to 3 districts - Phalombe, Nsanje & Chikwawa providing much needed health care. Our teams provided services to over 1100 women, children and men in the 2 days there were on the ground. During the past week - we have had a team of 5 doctors who remained to work in Nsanje District alongside the Military Medical Relief Teams. This weekend we have mobilised 16+ Drs to travel down to Nsanje & Mulanje to provide medical relief services. We are in touch with all 13 affected district teams and the needs remain huge...not only for health workers on the ground but medical supplies and materials. The floods have depleted their normal supplies and the risks of disease outbreaks remain high. Thank you all for your donations. We are nearly halfway to our target of $10,000. Not only that but today was the 1st day of this weekend's activities where a team of 45+ drs, medical students and other allied health professionals have travelled to 3 of the most affected districts - Nsanje, Phalombe & Chikwawa. The needs are great and the districts have requested for us to provide continued hands on the ground. Pictures are of some of the teams on departure to various camps. Your donations continue to support this dedicated team of local teams to provide medical care to those most in need in the camps. Share, donate and support our efforts. Just over 48 hours till the 1st team sets off for our maiden medical relief camp. we have mobilised 60 local drs, nurses & medical students from across the country to be part of this 1st of several camps we hope to hold over the course of the month. this weekend we will visit 3 districts Chikwawa, Nsanje & Phalombe - which as you will see on the attached map are among those most severely affected. Thank you all for your contributions. we have raised $3000 of our targeted $10000 - continue to share and support these teams of local health workers provide relief and medical support.